This is the Best Turkey Recipe for Thanksgiving! 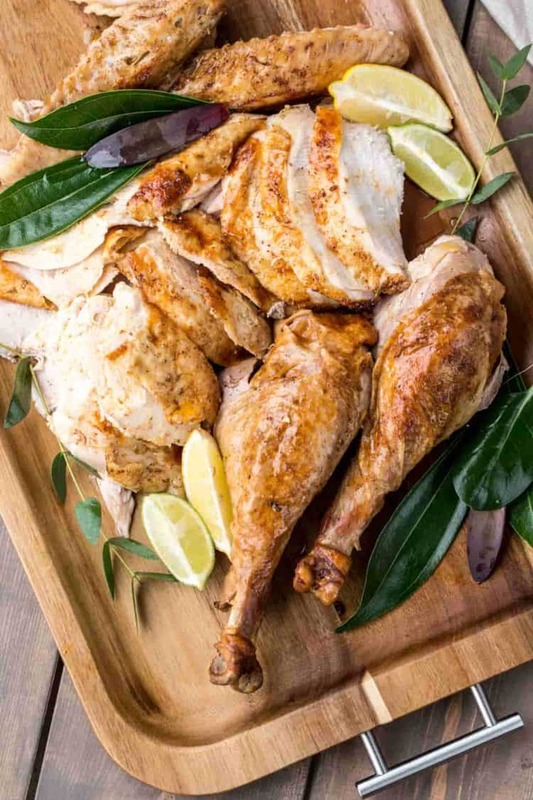 So juicy and flavorful and easy to prepare. 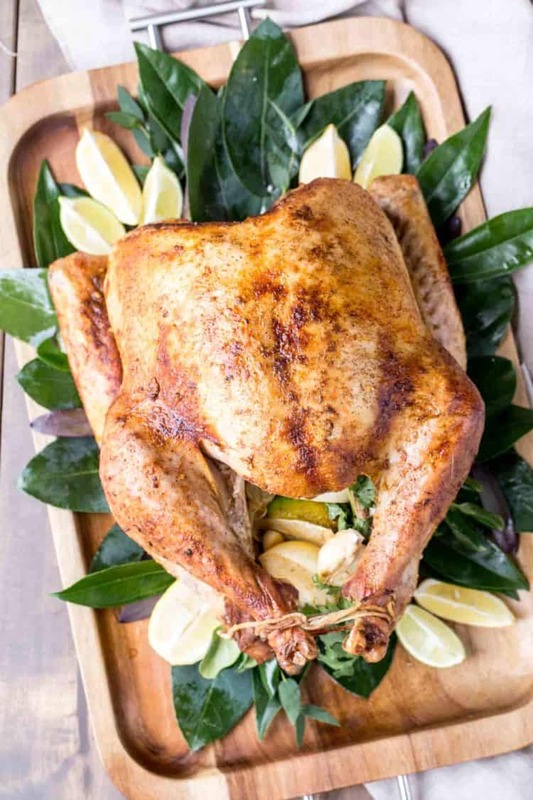 With step-by-step picture tutorials and tips, this is going to be the most perfect turkey you will serve for Thanksgiving dinner and all year round! To complete the Thanksgiving dinner, enjoy Turkey with homemade Cranberry Sauce, Mashed Potatoes and Mushroom Gravy! There are many methods of cooking a turkey. It can be grilled, smoked or cooked in the oven. Cooking the turkey in the oven is the method we will be using in this post. Biggest tip in thawing a frozen turkey is giving it ample time! Allow one day in the fridge for every 4-5 pounds of turkey. Thawing the turkey in the refrigerator is the best place for it. Rule of thumb for turkey per person is 1 to 1 ½ pounds of turkey per person. A turkey is pretty forgiving in the seasonings. 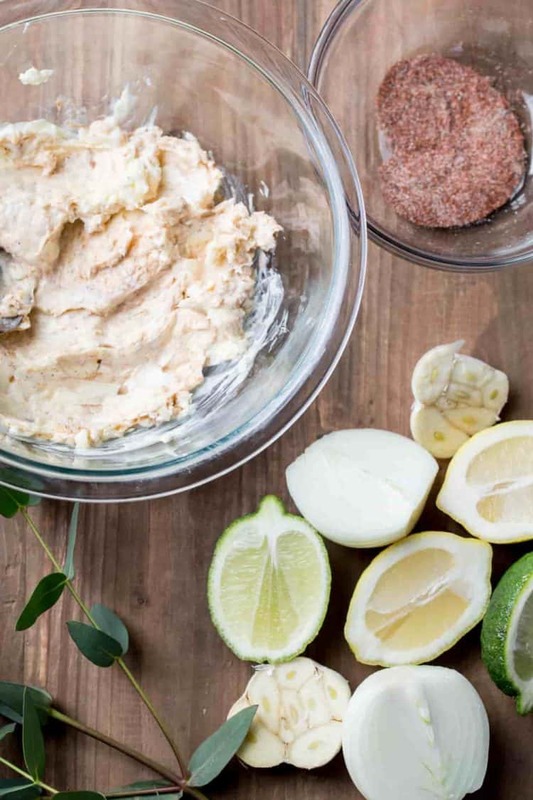 You can use your favorite seasonings and it will taste wonderful. 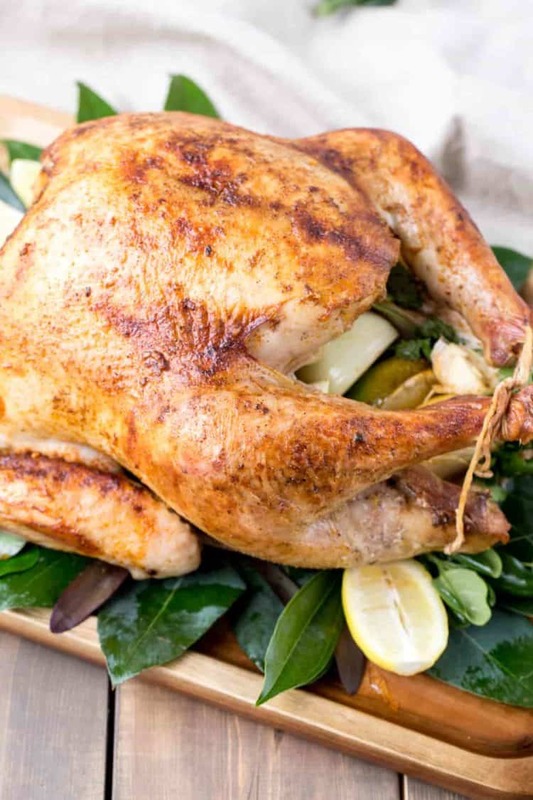 For a juicy turkey, you want to use butter or oil to coat the turkey, to keep it from drying and then season the bird. 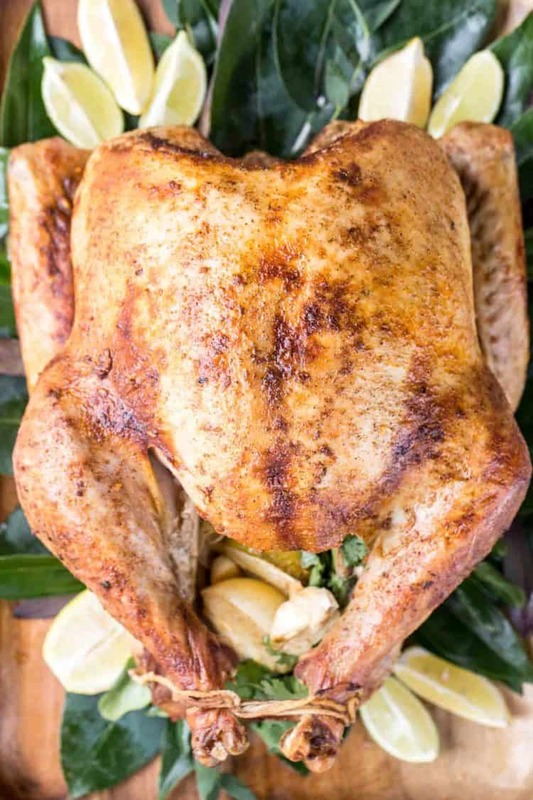 My favorite stuffing for the turkey is fresh lemon and lime with onion and garlic. Adds flavor to the bird. If you have fresh thyme or rosemary, add some to the stuffing along with the rest of the ingredients. A handful of parsley or cilantro is also wonderful. 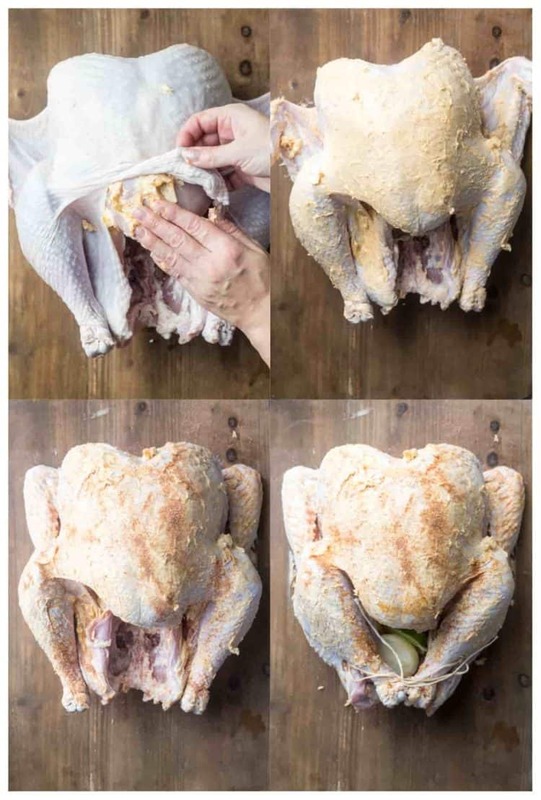 Don’t tie the legs too tight, the breasts need to cook through. Fold the wings to secure them under the neck/body. For a juicy and moist turkey, cook the turkey on a rack and add liquids to the bottom of the pan. Though this is a personal preference, I LOVE this method. Adding broth, fresh lemons and oil creates moisture in the pan and keeps the bird from drying and the aroma is phenomenal. If you don’t have a rack for the turkey, DON’T add the liquid to the bottom of the pan. Brown the turkey at 400°F for about 30 minutes, until breast of turkey is crispy and golden. Then, reduce the temperature and cook at 325°F for an additional 3-4 hours or until turkey is fully cooked, measuring with an internal thermometer to 165°F. Allowing the turkey to rest once it’s fully cooked allows the juices to penetrate resulting in juicy slices when carving. Can Turkey be seasoned in advance? Yes! You can prepare the turkey completely the morning of and just keep it covered and refrigerated. This is perfect in saving time if you are having a large party. The best way to transfer the turkey to a platter is to insert a wooden spoon under the turkey and a second one under the neck of the turkey, then lift together and transfer. Don’t throw away the turkey bones. Freeze the bones then make organic broth using the bones. Don’t discard the pan drippings. Use it to make a homemade gravy! Invest in proper TOOLS for the perfect turkey! TRAY– This wooden serving tray, it’s so beautiful for serving the turkey. TWINE– Kitchen cooking twine to tie drumsticks. THERMOMETER– Check for readiness of Turkey. 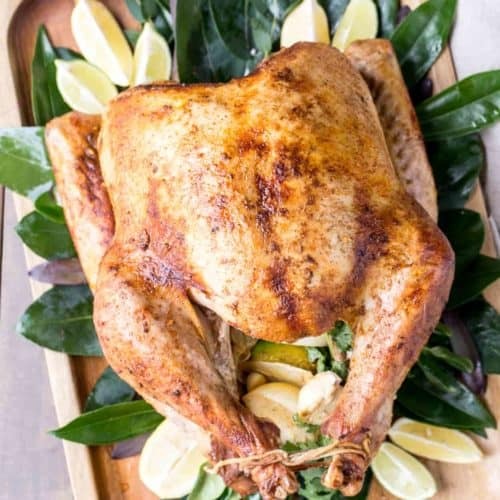 The Best Turkey Recipe resulting in a juicy and moist turkey with seasoned garlic butter and stuffed with lemon and limes and cooked in the oven. Adjust the oven rack to low. Preheat oven to 400°F. In a small bowl, combine all the seasonings. Combine butter, 1 Tbsp. oil and minced garlic. Add half the seasoning to butter mixture, mix. Remove bird from packaging and discard giblets and neck from inside the turkey. Completely pat dry the bird. Loosen and lift the skin on top of the turkey and rub some of the butter mixture underneath the skin. Rub the rest of the butter mixture ALL OVER the bird. Season the turkey with the dry seasonings. Tuck the wings of the bird underneath the neck of the turkey. Stuff the turkey with the onion, garlic, lemon, and lime (and a small bunch of fresh herbs if you have them). Tie the turkey legs with kitchen twine. Place foil on the bottom of an 11x15 roasting pan. Add broth, oil, parsley and lemon slices into the roasting pan. Add the rack into the pan. Place the turkey onto the rack. Roast turkey for 30 minutes at 400°F. Remove the turkey from the oven and baste the turkey by taking juices from the pan and pouring it over the entire turkey. 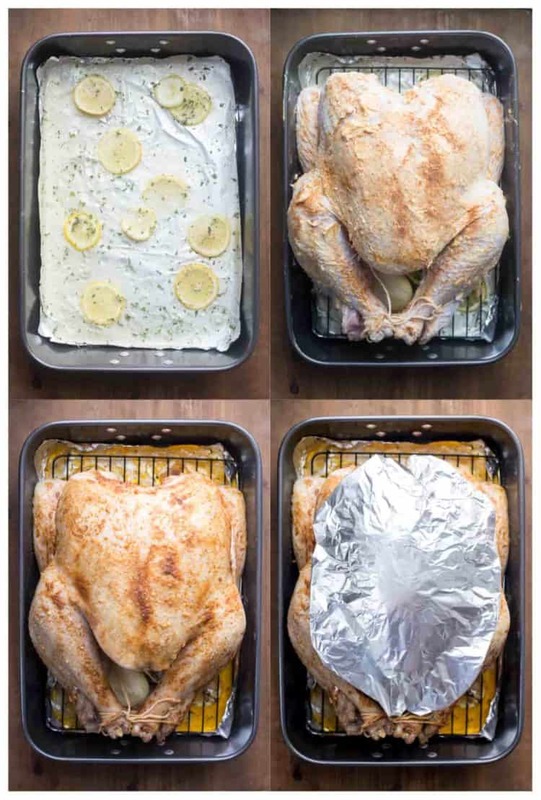 Fold foil in half and cover breast of turkey. Reduce oven to 325°F, cook the turkey an additional 3-4 hours until the thickest part of bird has an internal reading of 165°F. If the skin of the turkey isn't desired crispiness, broil 5-10 minutes, allowing the skin to become crispy. Remove bird from the oven and rest 20 minutes. Such a beautiful presentation of the Turkey! What’s the name of the greenery you used?